When high perceived value is critical, look no further than snack rack. Designed for the cheese connoisseur, Snack Rack features an eco-friendly bamboo cheese board mounted on a classic ceramic base. 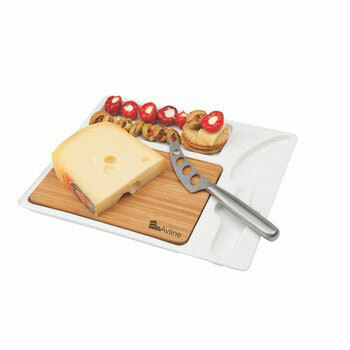 The ceramic base is designed to hold a stainless steel knife (supplied) as well as accompaniments that you would usually associate with cheese. And remember, the bamboo cheese board is laser engraved with your logo and organisations name. Being engraved adds to the environmental credentials of this set as no ink, solvents or other chemicals are used in the branding process. A laser computer controlled laser beam strikes the bamboo and vaporises around 1-2 mm of the bamboo, resulting in a 3 dimensional effect. This quality gift will be used at the office, at home or anytime cheese and snacks are consumed.